SUITABLE FOR ALL LEVELS - Comes in 3 sizes: Small, Medium and Large. PROVEN TECHNOLOGY EQUALS SUPERIOR PERFORMANCE - Broad-blade design for optimal water contact and building upper body strength. EXCEPTIONAL FUNCTIONALITY - Holes allow water to channel through the paddles so the fluidity of each stroke is unimpeded. CUSTOM-FIT - Wide-area wrist and finger straps are adjustable for a secure fit. CUSTOMER SATISFACTION - 30-Day Guarantee: If you are not 100% satisfied within 30-days, send it back for a full refund. Designed specifically for freestyle training, the Freestyler Paddles plane your hand forward through the water, improving reach and distance-per-stroke. 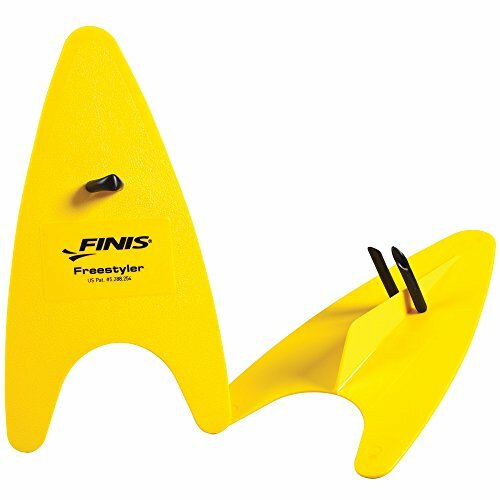 With a surfboard shape and unique skeg design, the Freestyler Paddles promote a strong pull through, better hip-rotation and increased efficiency. The adjustable finger strap offers a perfect fit and the narrow surface area helps prevent shoulder strain. Designed specifically for freestyle training to correct technique and build muscle. Surfboard shape decreases resistance through the water and planes the hand forward, lengthening each stroke. Patented skeg on the bottom of the paddle provides instant stroke feedback, streamlining and straightening hand entry. Tired of swimming with multiple paddle sizes for specific stroke techniques and benefits? Now you can maximize all your training needs with swimming's first multi stroke paddle. The I.M. 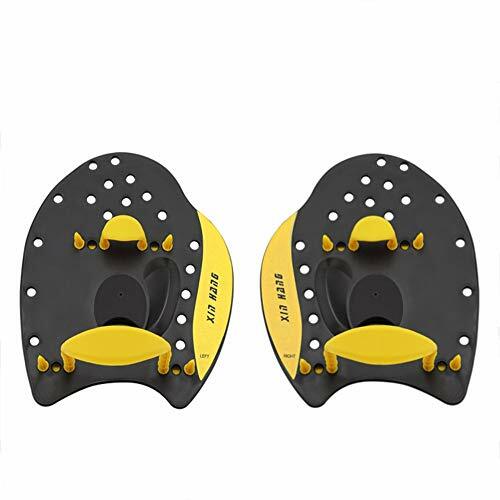 Tech Paddle is specifically designed to improve your technique for butterfly, backstroke, breastroke, or freestyle swimming - all with one training tool. 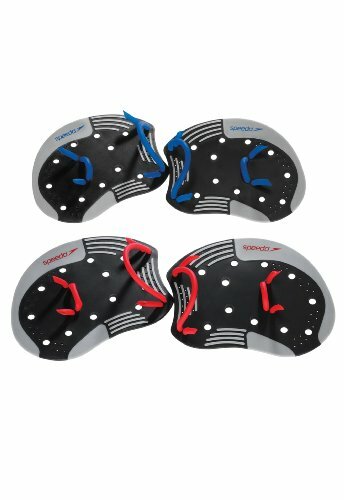 With multiple water channel holes to retain the feel of the water and other great features, this is a must for every serious swimmer wanting to improve strength, endurance, or technique and take seconds off the stopwatch. Look and feel your best as you play, train, or win in Speedo, the choice of champions and the world's #1 swim brand! Unique hinge design to initiate the catch for all swim strokes. Accentuates finger-tip flexion upon water entry. Reduced surface area and expose thumb to maximize feel for the water. Tubercles along edges for smooth pulling trajectory, greater ability and control. The all new Aqua Sphere MP Strength Paddle is a high-performance resistance tool that provides a natural feel of the water thanks to its shape and raised palm supports. The Brand of Paddle is the perfect fitness paddle for all swimming abilities. Material: Made of high quality polypropylene.Paddle comes with soft and comfortable silicone straps. 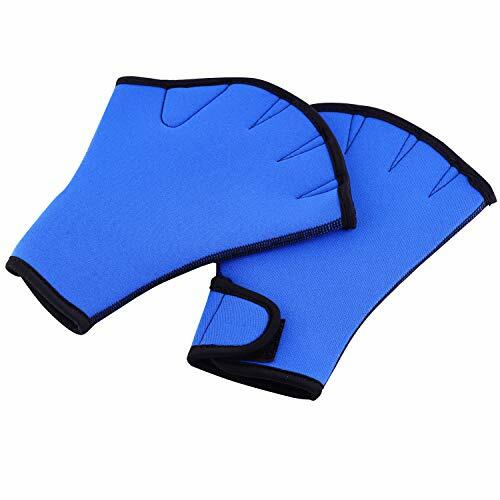 Wide-area wrist and finger straps are adjustable for a secure fit, providing great stability for your palms when swimming.Ergonomic design let your hands fall into a natural position for swimming while fingers spread apart naturally. Holes allow water to channel through the paddles so the fluidity of each stroke is unimpeded. 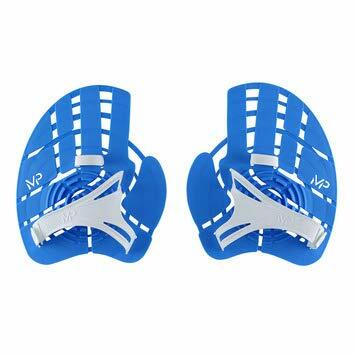 It's a perfect piece for working on hand form and movement during swimming and training. This incredible Arena Vortex Evolution Hand Paddle is the perfect training tool for the elite swimmer. Featured by soft, skin-friendly and comfortable. Sun protection. Full cover design can effectively avoid bite by jellyfish when in the deep water. 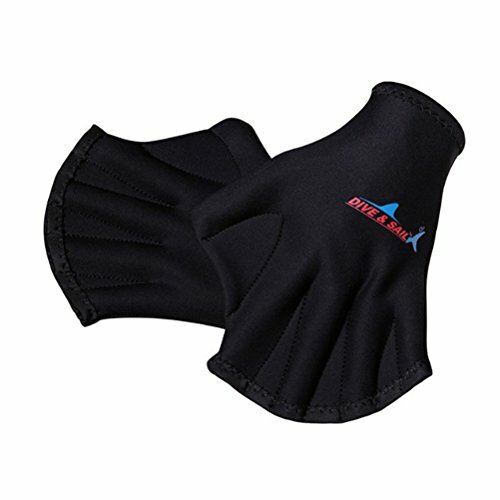 Can protect your hands from scratch and keep your hands warm in cold water. 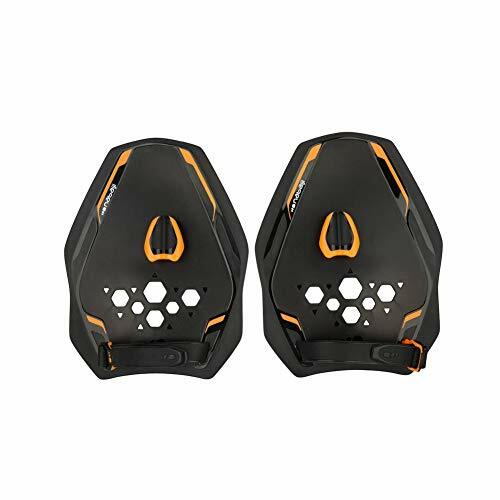 Material: The paddles are made of high quality polypropylene, which come with soft and comfortable adjustable silicone straps. 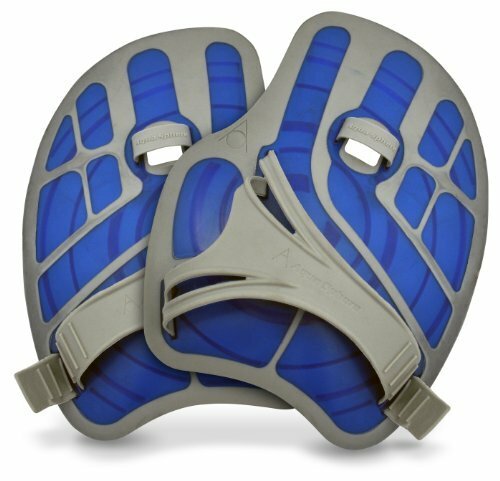 Wide-area wrist and finger straps are adjustable for a secure fit, providing great stability for your palms when swimming. Ergonomic design let your hands fall into a natural position for swimming while fingers spread apart naturally. Small holes allow water go through the paddles so the fluidity of each stroke is unimpeded. 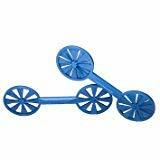 It's perfect for working on arm training and the upper part of the body during swimming . 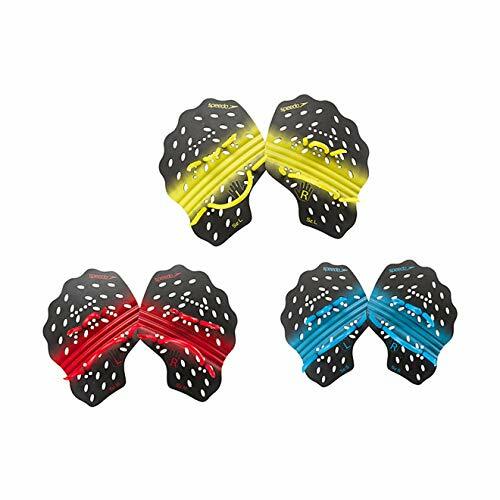 Blue Mango Swimming Paddles PRO QUICK'IN Black Orange Made for Advanced Swimmers Wanting to Work The Upper Body and Shoulders and Improve Their Swimming Technique. QUICK'IN SYSTEM : The patented and exclusive QUICK'IN system was designed and developed to make hand paddles easier to put on. It consists of a polypropylene fin and a piece of silicone attached under the surface of the paddle. The latter lets you adjust of the height of the fin by pressing upwards, for optimal comfort and hold of the paddle while swimming. 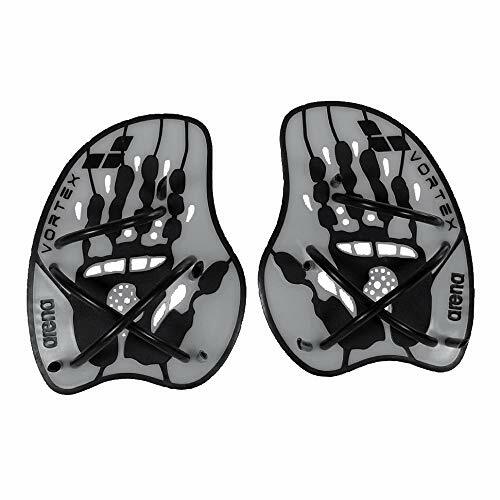 ADJUST TO FIT : You can fit the hand paddles in one of two ways: 1 - Attach the straps of your paddles to your wrists and use them like conventional paddles. 2- Use the QUICK'IN fin system on its own. In this case you must first remove the straps and wrist loops by sliding them through the slots in the paddles. 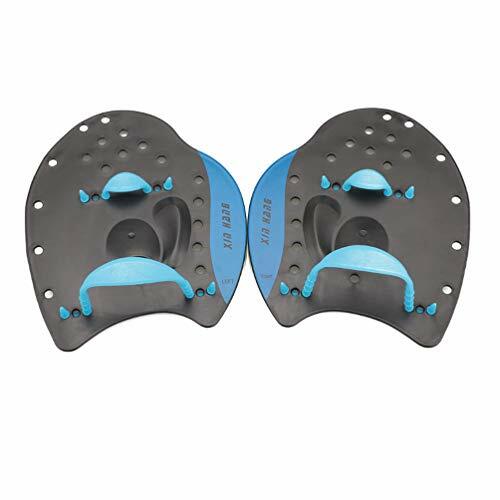 SAFETY : The edges of the paddles are made from SEBS soft plastic to avoid injury to yourself or others. Each pack contains 2 paddles. WHAT IS IT FOR? : A paddle is a piece of swimming equipment used to work the upper body (arms, shoulders, chest). It is worn on the hands. Increases propulsion and speed in the water Lets you feel each stroke. Three sizes of paddles available (larger or smaller for more or less push against the water = power or frequency training). 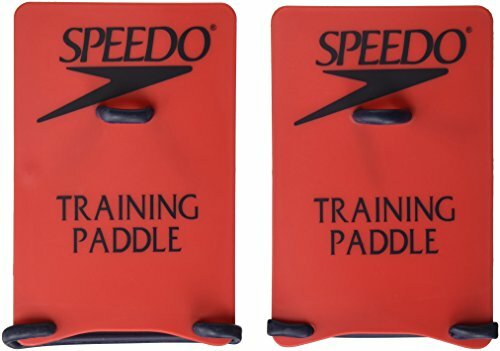 RECOMMENDED AGE : Like any large hand paddles, PRO hand paddles are very physically demanding and may cause injury if used by young swimmers or too intensively. Made of the high quality neoprene material,soft material makes it more fitting to skin. The experience is different: the paddles help you to experience the appropriate stroke angles for various stroke stages, such as the S-type paddling route, the inner stroke, and the outer stroke.